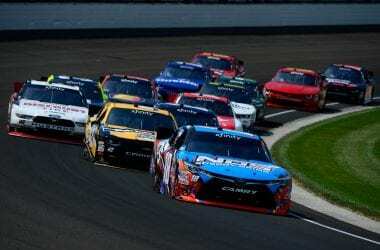 Stage lengths for the NASCAR XFINITY Series race at Indianapolis Motor Speedway in July have been tweaked slightly. New format: Stage 1 ends following Lap 30, Stage 2 ends following Lap 60 and the race is scheduled to end following Lap 100. The previous format was 25-50-100. “Following the previously announced updates to the competition package for the NASCAR XFINITY Series event at Indianapolis, NASCAR will issue a rulebook bulletin that updates the stage lengths for the race,” Scott Miller, NASCAR Senior Vice President of Competition, said in a statement.